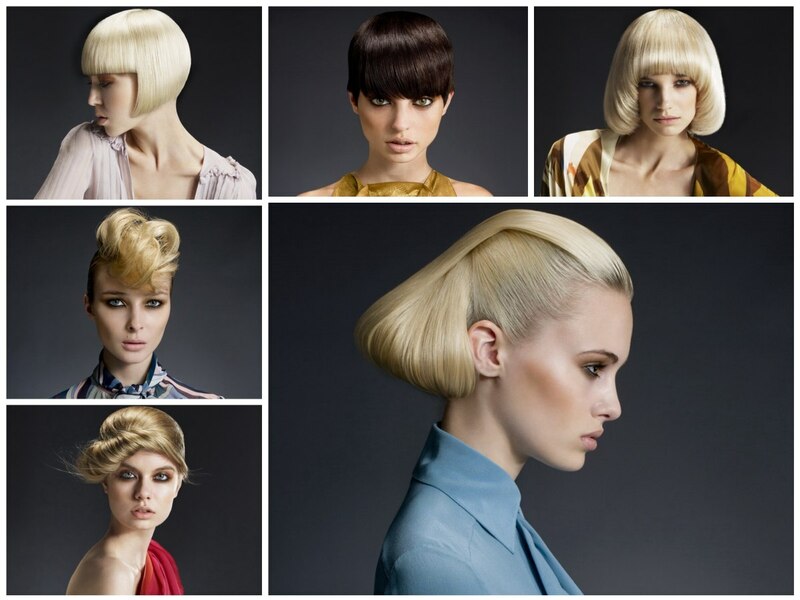 Mix modern graphical and architectural lines and some of the favorite hairstyles of the 60s and 70s and you get a mind blowing contemporary collection of looks that is all at once elegant and extravagant. Shapes are reduced to their essence and the hair is treated to bring out its full beauty with all the supple softness and shine it can have. A perfect balance of control, polished and bold expression. Bob, bowl cuts, round styles and rolled, tufted creations celebrate the color blonde, but there was room for one brunette style as well. The soft color together with the smooth texture gives even a very geometric haircut enough gentleness to have a sensual and romantic allure. A very short A-line, cut to laser sharpness and treated with smoothing serum for a precious sleek surface without any disruptions. Straight lines and distinct angles dominate the shape, but the entire look still exudes a soft, sensuous feel. Part of the reason is the beautiful beige blonde color and the round, silhouette that closely follows the contour of her head. The partition is used as a strong design element with its unique line that allows the front section to originate way back of the crown. If you have finer hair and are tired of trying to build up volume in it, the new sleek shorties might just be the right new looks for you. The hair is contoured close to the head and cut in a cap shape that continues all around the head at the height of the eyes. 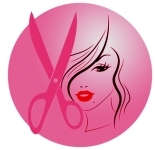 The lower hair is clipped short and on each side, in front of her ears a tiny stylish and feisty sideburn was shaped. If it was not for the little curve in the fringe there would be perfect symmetry in this simple but daring short haircut. Her color is a cocoa brown, a great match for her skin tone and eye color. One of the most memorable retro hairstyles is round all over. Wherever you look, on all sides there is no interruption to the lines that circle the head in an angled oval. Tapering along the sides of the face transitions into the bangs and down again. It has a high center point from which all of the hair circles out. 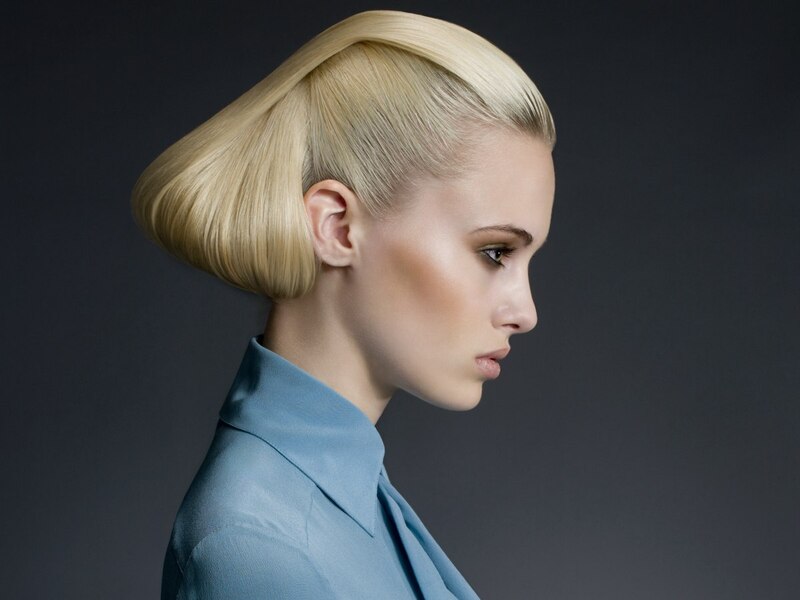 The ends are styled inward to a large, billowing roll giving the look its signature shape and creating the thick volume. Her color is a beige blonde with platinum highlights for a most precious radiance and brilliant shine. Preppy, immaculate and space age chic. A novel interpretation of the chignon boasts a unique combination of techniques to create this updo. The hair was separated into a wide section that includes the long front hair and then the sides to a spot just behind the ear. The side hair was taken to the back where it was gathered and pulled fairly tight for a strict (but not painful) fit. Then the resulting long pony tail, which includes side and back hair was folded in an pinned to a puffy and smooth chignon. As a last step the wide front, after treated with smoothing lotion and a strong hold styling product, was folded back over the head, across the chignon and also fastened invisible, underneath it. Looking for a new look that will make heads turn at the office? Mix a bit of strictness with a playful tuft for a new approach to professional hairstyles. To avoid fly-aways, the hair was treated with either gel or some wax and then combed toward the back where it can be twisted into a tight bun or as an alternative, gathered into a ponytail. The front hair frolics in large curls and also displays its lighter blonde color in the most refreshing way. Shaped almost like a seashell, this rolled up look displays true sense of style and innovation. It is inspired by vintage looks, but most of all by the organic, round and flowing shapes that are found in nature. The message is soft, feminine and deeply romantic. All of it with a glowing aura filled with the golden radiance of her medium blonde hair.